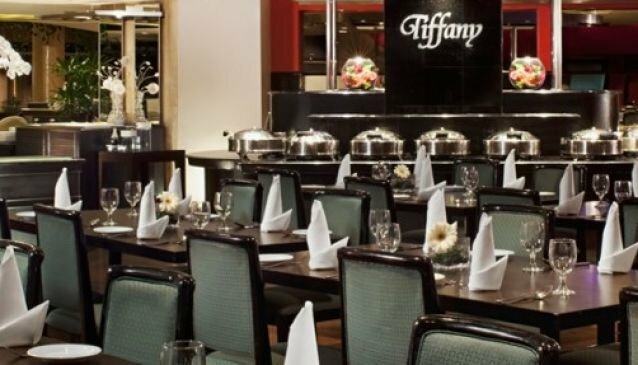 Tiffany Café and Restaurant offers an appetizing Halal International buffet spread. A wide selection from fresh Sashimi, DIY Kueh Pai Tee, an assortment of seafood, tender BBQ ribs to irresistible Chocolate Fondue and Durian Pengat await the guests. Though the selection is comparably smaller than other restaurants', quality is never compromised at Tiffany Café and Restaurant. Its location at Furama City Centre in Chinatown also makes it easily accessible and serves as a perfect meeting place for business lunches and meetings. Guests will feel satisfied as the buffet comes to an end, and they can wind it up with that cup of coffee or simply choose from the variety of teas available.